Daphne ‘Summer Ice’ is becoming a widely recognized small shrub for the Pacific Northwest. It’s dependable, easy to care for, once established, and possesses fine qualities as such persistent leaves (for the most part) and wonderfully sweet fragrance that’s present almost year round. 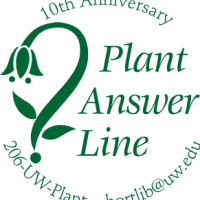 In the spring of 2001 the Elisabeth C. Miller Library launched a new service designed to answer plant and gardening questions quickly over the phone or via email. Now we’re celebrating the ten year anniversary of the free answer service for gardeners. UWBG arboretum horticulture staff are taking Tuesdays by storm! The 6 member crew, along w/ the 2 recent temporary gardener hires, plus Tuesday volunteers are now making an immediate impact on improving plant collections care and general garden aesthetics. For example, this past Tuesday, there were 10 busy bees working in the Sorbus (Mountain Ash) collection, weeding and mulching. Check out the finished product (photos). One of the most widespread problems with trees in the urban environment is the failure to recognize the tree’s mature size. If one doesn’t take into account the space required when the tree grows up, conflicts are sure to arise. To make matters worse, the tree is often faulted for encroachment! Several trees surrounding the Arboretum’s Boyer Parking Lot have grown up and encroached on the gravel parking spaces. them in their working groups. Charitable plant sales take place all over the Northwest every year and this cold wet spring is no exception. Take a look at our plant sale calendar, then go out and buy a few plants for a good cause. Yesterday the UW Botanic Gardens staff installed some new condominiums west of the greenhouses near the Center for Urban Horticulture. Oh, not for people, but for purple martins.Purple martins, you see, are our largest swallows, and they have been in decline for a long time. They nest in holes, and they like to live together in a colony. Since 1997, the Center for Urban Horticulture (CUH) has been the recipient of plants from one of the most prominent names in the perennial plant industry. Blooms of Bressingham (referred to simply as “BLOOMS”) has been a source of the world’s finest perennial plant introductions for many years. Thanks to a grant from the Jiji Foundation the Garden-based Restoration and Outreach Workgroups (G.R.O.W.) Program was launched in January, 2011 and is actively engaged with three high school classes and one after school teen center program.